About the author: The 2016/17 school year marks Bridgette Byrd O’Connor’s fifth year teaching BHP as a semester-long history course. She teaches ninth and twelfth graders at Saint Scholastica Academy, a private school for girls. Bridgette teaches her 120 students a year in three 90-minute sessions per day. As all teachers know, the start of every school year begins at the end of the previous year when you’re jotting down notes about what to tweak in your lessons after reading through your students’ evaluations of the course. This process takes you through the summer months, as you begin to think like Scarlett O’Hara: “After all…tomorrow is another day.” Unfortunately, that tomorrow–the start of the next academic year–comes all too quickly. And that, of course, leads to some rather frantic planning in those last few days of summer, which is where I find myself, with school starting in the blistering heat of August. I’ve been spending my days revising my BHP course plan. I’m trying to plan every day of the upcoming semester in order to ensure I allow enough time to cover all of the high points in this 13.8-billion-year journey that is Big History. In doing this, I strive to always keep the narrative of the course in mind and make sure that there’s a strong focus on the core concepts of thresholds, scale, claim testers, and origin stories. I’ve also been checking the BHP Teacher Community on Yammer quite a bit, jotting down notes on new activities and ideas that have been posted by other teachers, both new and veteran. The Big History Book Club has been great at generating discussion and ideas on how to connect the classroom with Yuval Noah Harari’s book Sapiens: A Brief History of Humankind. 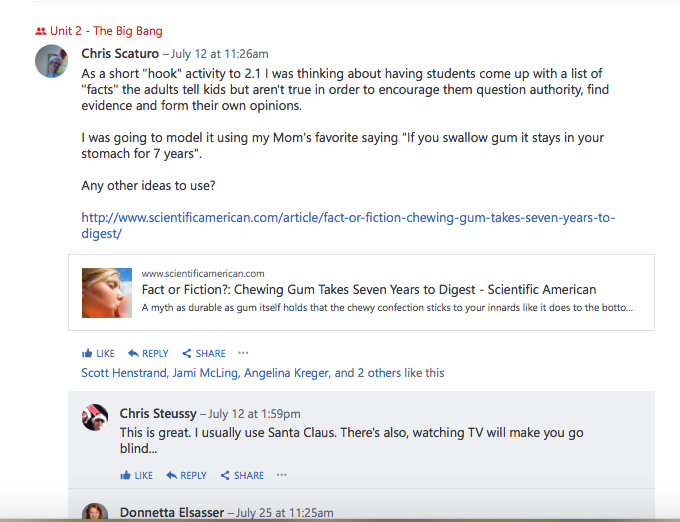 I’ve also incorporated ideas from discussions with BHP teachers Chris Scaturo and Michael Berks from the Unit 2 and Unit 6 groups on Yammer. The first of these is how to “hook” students with a short lesson built on the premise, “lies my teacher or parent told me,” so that students learn to question authority by using other claim testers. The second is a link to an article about how human genes changed with the advent of farming. Planning for my first year teaching Big History seemed like such a daunting task. 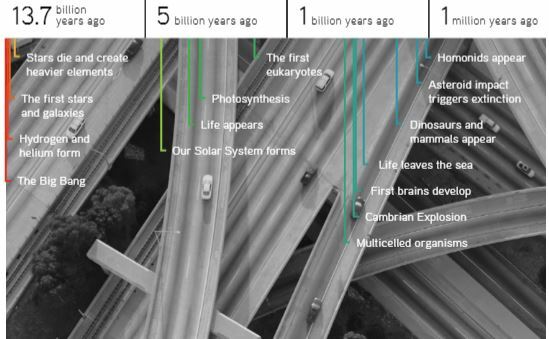 How do you cover 13.8 billion years of history in a semester? And will I learn enough in one summer to seem knowledgeable about astrophysics, cosmology, chemistry, and biology? Now, with four years of teaching BHP under my belt, I’ve learned that you must diligently plan your semester or year in order to cover the Big Bang to the future. As for knowing or learning enough of the science, my students and I went on a learning journey together, which was the best way to conquer the topics that I was hesitant about. Students feel as though they are truly invested in the course if you’re all learning together. And you will be, because, let’s face it, none of us will ever know all there is to know in this course! New information is discovered almost daily and at least 13 different disciplines are included in the course. In other words, give yourself a break, take a deep breath, and enjoy teaching the course and learning with your students. PARALLAX: HOW DID THEY COME UP WITH THAT?